The singer turned beauty products mogul, Rihanna alias Bag Girl Riri has come out to reveal that it took her over two years to create Fenty Beauty’s first ever bronzer. The “Work” hitmaker has announced the launch of her much anticipated Sun Stalk’r instant warmth bronzer on Instagram. This bronzer has over eight shades. Bronzer isn’t one shade fits all, It took @badgalriri over two years to develop the perfect bronzer that brings out the right pigments for natural warmth and glow on all skin tones! The bronzer which is described as a ‘smooth soft-matte powder formula’ to help add warmth to people’s skin just in time for the summer season goes for $30 (3,022 shillings). The shades, ranging from light to dark, are Inda Sun, Shady Biz, Private Island, I$land Ting, Bajan Gya (which means Barbadian girl), Caramel Cutie, Coco Naughty and Mocha Mami. But for those itching to get their hands on the new bronzers now, they will have to wait another week as the products won’t launch until April 5. Fans appeared excited about the launch as Fenty Beauty has become one of the leaders in the makeup industry when it comes to diversity. Lol now that Fenty announced bronzers watch all these other brands start rolling out bronzer posts to remind us that they have them, too. 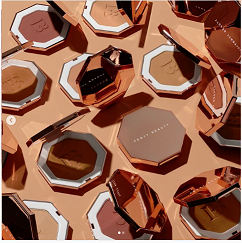 This news comes as Rihanna released 50 different shades of her Pro Filt’r concealer earlier this year to match her line of foundations and keep her inclusive range pushing the boundaries of beauty and fit for all skin tones. Bronzers are used to give skin a healthy glow. A well-chosen shade makes you look as if you’ve spent time in the sun. Bronzers enhance your tan, artificial or not, and darken the skin without masking it. Some bronzing products contain a lot of shimmers, so the light-reflective particles make you sparkle with radiance. Other bronzing cosmetics have a more natural matte finish and add warmth and definition to your skin. Bronzers come in powder, gel, liquid, and cream form and can be intended for the face or body. Using a bronzer that’s too dark or has the wrong undertones can just look muddy and artificial on your skin—not quite the sun-kissed glow you’re looking for. A bronzer that looks perfect on your skin tone in summer can look much too dark on your skin in winter, meaning a constant battle to find the best shade.